I see him and knows what this turmoil inside of me means: He's the one. My forever. Kayla is the nature lover, the all-American beauty who can't understand why she's so drawn to distant, brooding Lucas. Adopted as a young child, she has no way of knowing that she's inherited a terrifying-and thrilling-gene that will change her life forever. Lucas is dangerous, gorgeous ... and a werewolf. As leader of the Dark Guardians, shape-shifters who gather deep within the state park, he has sworn to protect his pack. But when Lucas finds his true soul mate, his love could put them all in harm's way. Kayla is back at the national park this summer, this time working as a trail guide for visitors. Her adoptive parents had brought her here last summer as part of her therapy, to help her face the deaths of her parents, and she fell in love with the place. She also came back for another reason - to spend more time with Lucas. Dark and mysterious, Lucas both intrigues and frightens her. Out on her first hike as a guide, Kayla must face her growing feelings for Lucas . . . as well as danger lurking in the forest at every turn. Moonlight is a great introduction to the Dark Guardians series. Kayla doesn't know anything about the world of the Dark Guardians, so the reader learns along with her rather than simply being thrown in. It's a little predictible, and readers will figure out what's going on long before Kayla has a clue, hence the three star rating. But it's still a cute, easy read. This would be a great series for reluctant readers, as it's pretty quick to get through yet is still interesting. The other Dark Guardian books are Full Moon, Dark of the Moon, and Shadow of the Moon. 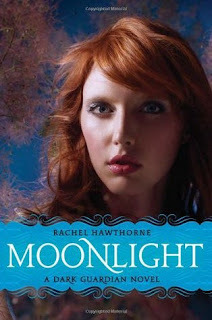 Rachel Hawthorne also writes under the pseudonyms Lorraine Heath and Jade Parker.